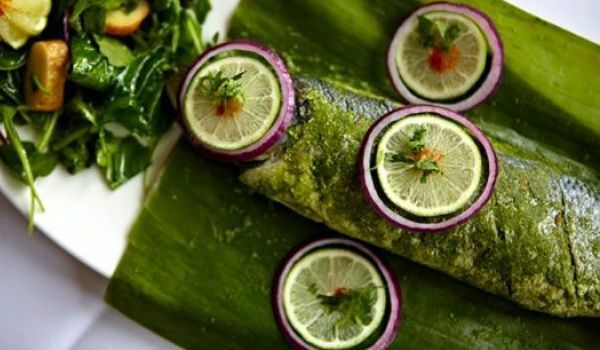 Patrani Machi is a Parsi recipe where the fish is basted in spices and then wrapped in banana leaf before cooking it. The fish which absorbs all the flavors while being slow-cooked is relished during the festive occasion of Navroz. In the mixer jar, add mint, coriander leaves, grated coconut, chilies, garlic, sugar, onion, cumin seeds and salt. Grind it until it turns into a fine paste. Clean the fishes and slice them both to get 4 pieces. Apply the above made chutney to the fish piece and sprinkle lemon juice over it. Now, cut the banana leaves in such a way that it is big enough to wrap each fish piece properly. Heat the leaves on both the sides and wrap it up. Thereafter, tie it with a string. Now, grease the baking tin and place the fish in it. Pour some ghee over each piece and allow it to bake for about 15 minutes. Your patrani machhi is ready to be served! !